Meet the world’s largest free spanning dome structure – the Singapore Sports Hub roof. Spanning three football fields and rising more than 80 metres from the ground, it is a prime example of collaborative design between the architectural vision of Arup’s sports venue designers and the structural engineering team using Building Information Modeling (BIM) and Tekla software. The roof structure of the Sports Hub is comprised of a series of 3D triangular trusses fabricated from CHS ranging from 139.7mm to 508mm in diameter, producing architecturally appealing curved lines in the exposed structure. These curved lines posed many challenges to the fabricator but the use of Tekla and BIM enabled the team to overcome them. The Arup design team used Tekla to optimise the fixed and movable roof design, resulting in a highly buildable roof that was extremely efficient, lightweight and sophisticated in form. From the onset, the Arup design team recognised that the successful delivery of this roof structure needed a fully integrated approach to the architectural and structural design, as well as the subsequent construction. Interoperability between the design and structural model was a critical challenge that the Arup team needed to overcome. The team was able to optimise the roof structure using specialised in-house analysis software, which was then linked to Tekla’s BIM software through a plug-in. 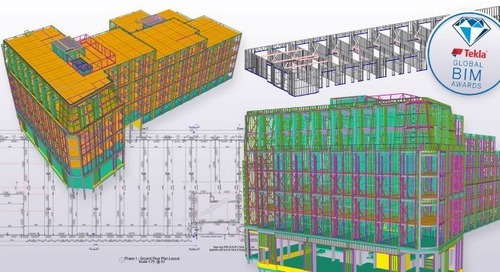 The interoperability enabled Arup to automatically update the Tekla model to match the latest optimised design geometry, which would not have been possible using traditional methods or solutions that do not connect. BIM was important for achieving a seamless collaboration between building services, the concrete structural work and architecture. Arup was able to detect potential clashes between building services and the building structure and rectify the design promptly. For example, approximately 42km of precast terrace seating had to fit together perfectly with building services like cooling. Mike King, Principal at Arup’s Singapore office and Structural Leader of the Sports Hub project, has more than two decades of experience designing long-span structures for major stadiums, airports, sports arenas and stations all over the globe. “With every new job, we see an evolution in terms of skills and how we use technology. The important part is in learning how different software packages talk to each other, and how they transfer information between each other so that when you go back to the geometry model, you don’t lose all the information that you had in the analysis model. That sort of interconnectivity is crucial,” said Mr. King. “For steel, it was critical to use Tekla because it was part of the design tool to develop the geometry and efficiencies of the roof structure. 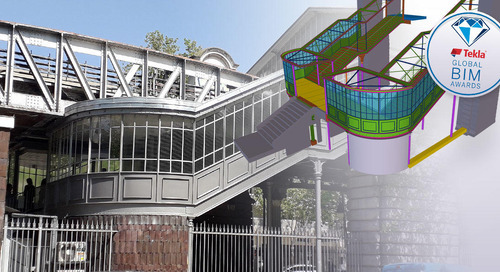 Arup has a long history with Tekla, and we have a lot of expertise using Tekla software. We work closely with Tekla on the development of the software, so our experience has been very good,” he added. 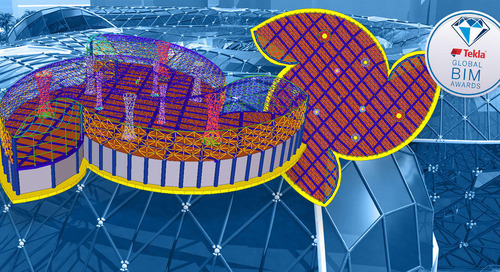 Arup’s Tekla model that defined the geometry and member sizes of the roof structure was important to ensure that all connection design information was properly imported into the base model. In order to ensure that the design team’s intentions were fully reflected in the Tekla model, Yongnam, the steel contractor, developed a system which checked all the essential data stored in the Tekla model against the design data for each and every intersecting node. 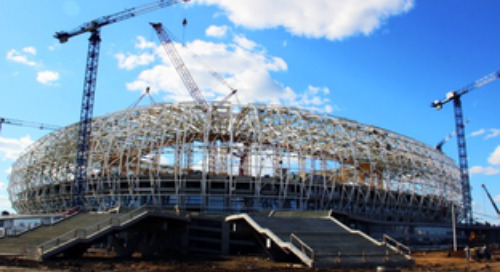 According to Mr. King, when it came to delivering the roof structural model to Yongnam, it was critical that the model was 100% accurate – and with the Tekla model, they were able to guarantee the accuracy of the geometry and structural members. Yongnam in turn used the Building Information Model to develop into their fabrication documentation and drawings for fabrication from and introducing connections. In addition, it was important for Yongnam to gain BCA’s (Building & Construction Authority) confidence that the structure could be fabricated and erected safely and smoothly. To achieve that, they presented the information to BCA through the Tekla model effectively. The Building Information Model was also used by the cladding contractors to ensure their systems fit within the structure and develop how they attached to the structure. “They also used the model to develop the erection sequences – how they would bring elements on site, what size of elements they could fabricate on site, and what size of elements would be lifted by the cranes. 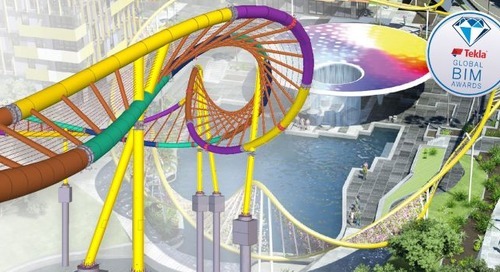 The Tekla BIM model was critical in all of those phases,” said Mr. King. One of the key challenges with the Sports Hub project was to keep the roof structure steel weight as low as possible for not only the economy of the building, but also to reduce the embedded carbon of the project in terms of the environmental effects and sustainability. “The biggest load on a roof of this nature is the self-weight of the steel structure, so if you can minimise that, then you can go a long way in creating an extremely efficient structure. For example, if it was not an efficient structure and had an extra 10kg per square meter of roof steel which was not necessary, then you would actually need 30 to 40 percent of steel again to hold up the excess steel that you didn’t drive out through efficiencies,” said Mr. King. 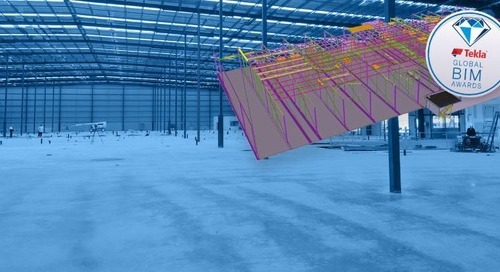 When it came to reducing structural steel weight, the use of BIM paid dividends. It helped the Arup design team to optimise the geometry of the roof, the structure and also to have an architecturally elegant form. They were able to fine tune the steel structure, both in terms of the design and how they documented it, in order to minimise the amount of steel weight. “For the Sports Hub’s roof, we have a 312m span that weighs just over 120kg per square meter, so it is an extraordinarily efficient roof driven by the form of the roof, and also driven by the efficiencies from parametric modelling and developing the roof structure through BIM. This is probably twice as efficient as any other roof for a stadium of this size, particularly in holding up a moveable roof,” he added. 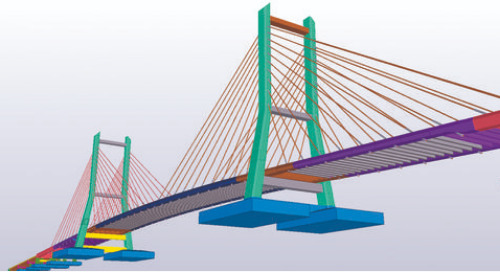 “We like Tekla for these sorts of structures because it is the industry standard. 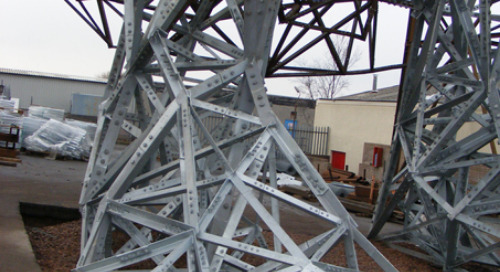 It’s the solution that steel fabricators are comfortable using and have the confidence in. So we knew that if we did our documentation in Tekla, then we could hand that model over to any steel fabricator in the world and they would be able to utilise it to develop their own fabrication model, which ultimately saves time,” said Mr. King. According to Mr. King, BIM has dramatically reduced the amount of time needed to build a structure of this nature compared to 10 or 20 years ago. But the more interesting benefits are the resource efficiencies that it drives into the building itself and the reduction in steel quantities and the effective collaboration that can be gained from transferring information from the designer through to the steel fabricator and right on to the end user. The Singapore Sports Hub was the first project in Singapore to utilise BIM from start to finish and is an amazing showcase of collaboration between multiple stakeholders. The project has shed light on the collaborative design efforts between the architectural vision of Arup’s sports venue designers and the structural engineering team. For its bold design and construction approach, the Singapore Sports Hub was awarded the Platinum award at the BCA BIM Awards 2014, as well as “Best Steel Project” at the Tekla Global BIM Awards 2014. The Unger Steel Group, based in Austria, is a frontrunner in the global construction industry. Unger creates tailor-made solutions for construction industry with a whole spectrum of service. Efficient, accurate and reliable planning plays a key role in the success of concrete construction. US-based F.A. Wilhelm Construction trusts Tekla Structures as a tool for concrete pour planning. Cullen Steel chose Tekla products because of the high level of automation. Benefits that lead to increased productivity continue to be the most important advantage for Cullen Steel. Students of Karadeniz Technical University in Turkey won the student category of the Tekla Global BIM Awards 2018 with the concept design of BlackSea-TORM Expo fair building.